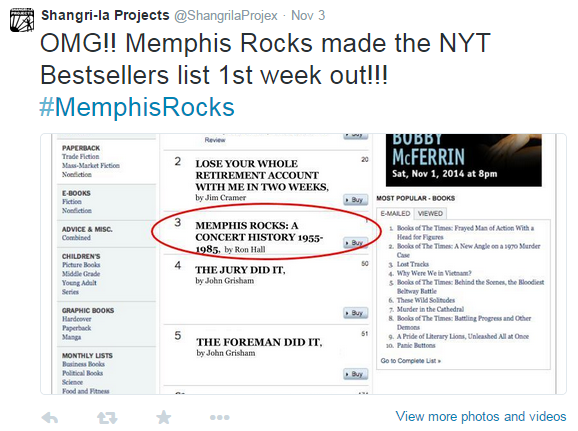 Ron Hall & Sherman Willmott’s “Memphis Rocks: A Concert History, 1955-1985” is by multiple accounts an excellent book, but it is not currently and never has been a New York Times best-seller as Willmott’s company, Shangri-La Projects, has repeatedly claimed on social media. Note Shangri-La added a “parody alert” comment to the Facebook post on Nov. 7 after I began drawing attention to the company’s deceptive marketing practices. Shangri-La (ostensibly Willmott, the company’s principal) began hiding behind this half-baked parody defense only after I notified a New York Times senior editor of the Memphis company’s dubious marketing claim. I first simply advised Shangri-La the picture they posted was a hoax, thinking someone had probably created it as a joke and they’d inadvertently mistaken it for reality. Shangri-La Projects’ reply? “Checked w a buddy who works @ internet-he said if it was on both twitter & internet was prob. something wrong w your fact checking.” That’s when I concluded the Mid-South publisher was purposefully engaging in deceptive marketing, as any reasonable person would. 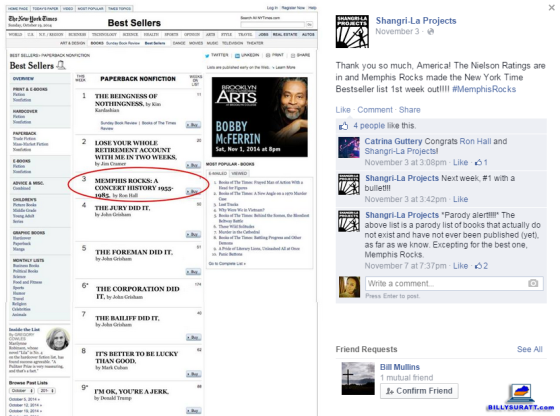 The problem with Shangri-La claiming their fake New York Times best-sellers list picture was a parody rather than what it really was — a lame attempt at viral marketing for “Memphis Rocks” — is in the presentation. The photo itself might be considered parody, but the presentation is completely devoid of any appreciable social or literary commentary on the original work being lampooned: the vaunted New York Times best-sellers list. The majority of Shangri-La Projects’ few social media followers who engaged with the post appeared to believe its purported legitimacy. At least one of those users has since deleted all of their own social-media references to the “Memphis Rocks” book’s bogus achievement and admitted to being suckered. If a reasonable person, much less a media-savvy one, can mistake your “joke” for truth and the only point of that joke is to sell a product, that’s not parody — it’s deceptive advertising, and it’s illegal. The “Memphis Rocks” case serves as a valuable reminder of two very important business tenets for small-business owners: 1) Be smart in crafting your marketing initiatives, especially in online marketing, and 2) Never, ever allow your customer service focus to lapse. Shangri-La Projects accused me of having no sense of humor, but in this case the joke’s on them — I was planning on buying “Memphis Rocks” until their smarmy reply to my well-intentioned first contact.